How do I know when to use Every Door Direct Mail® (EDDM®) or Direct Mail? That’s why we’ve created this guide to illustrate the difference between the two. Every Door Direct Mail®, is a simple, cost-effective solution that allows you to target the neighborhoods that include the ideal customers for your business. Instead of purchasing or creating a mailing list, addresses for EDDM® mailings are based on mail carrier routes in a particular ZIP code. Our EDDM® map tool allows you to pick routes up to a five-mile radius from your chosen location. Take a look at our EDDM® Selection Route video tutorial. Direct Mail service gives you the opportunity to reach past, current or potential clients with postcards, brochures, and letters. Instead of choosing mailing routes, direct mail marketing requires a mailing list of the individuals and/or businesses you would like to reach. The advantage of this is that you can target individuals by demographics like household income, ages of children, political party affiliation, and much more. Check out the info below to find out which type of mailing is best for you! Every Door Direct Mail® is ideal for covering specific neighborhoods to reach as many people as possible. This option is great for new local retail businesses that want to announce a grand opening, real estate agents marketing properties in a specific neighborhood, or established businesses with a special event or promotion. Quantities start at 100, and postage is a flat $0.1675 per piece. Choose from 11 sizes on 14PT or 16PT stock. UV or Matte finishes are available as well. With Full-Service, we take care of the entire process for you. Just download one of our Full-Service templates, create and upload your print files, choose your targeted in-mailbox date and routes with our online tool, and we’ll handle the rest. This service is for businesses that want to be more hands-on. Download a Print Only template, create and upload your files, and we will print and ship the cards back to you. You will be responsible for filling out the appropriate paperwork and submitting it to the post office for delivery. The mailing permits required by the USPS® are different depending on the type of EDDM® postcards you choose, so make sure that you download the correct template for your mailing. We offer design services if you don’t feel comfortable setting up your files. Our direct mailing services are ideal for targeting specific demographics that are not always in the same neighborhood. Businesses also use direct mail postcards to reach current and inactive clients. For example, a new pediatrician may use direct mail printing to send postcards to families with children. Political candidates often use direct mail to reach voters with a specific political party affiliation. Minimum quantities are 250 for Standard Mail and 500 for First-Class Mail. 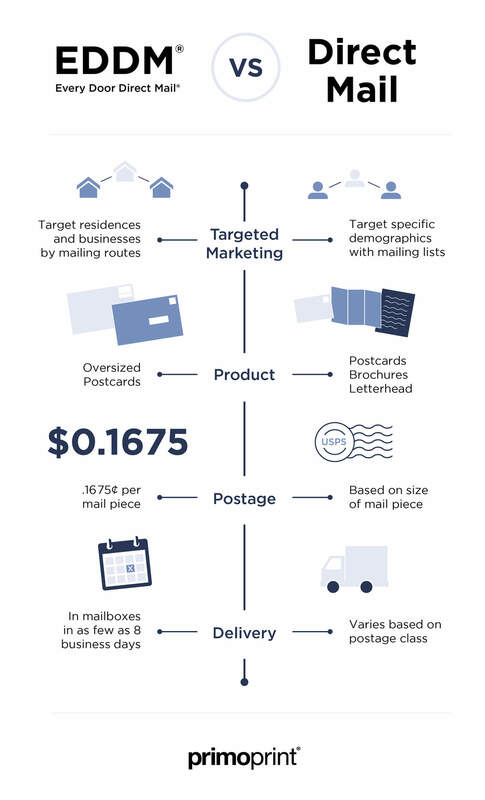 Postage costs depend on the size of your mailpiece, class of mail (Nonprofit mailing is available), and your list. After we validate your mailing list, we’ll provide postage prices. In addition to postcards, direct mail is available for letters and brochures. Additional tabbing charges may apply. Ready to get started, but still have a few questions? Our knowledgeable support team is happy to assist you with your order. Jen is the Brand Manager at Primoprint. She's responsible for our brand development and strategy as well executing marketing campaigns. She's an avid fan of the Carolina Panthers, craft beer, yoga, and good design.